What is behind global financial markets’ extreme moves since China’s decision to allow its currency to move to a managed float? One explanation is that investors increasingly fear global disinflation is not a dragon that has been slain by muscular central bank measures, but a phoenix that is rising from the ashes. Certainly, the direct impact of the renminbi fall on US and European inflation and economic activity — even if it extends to 10 per cent — is too small to justify the large falls seen in bond yields and inflation gauges. The weight of China’s currency in the trade-weighted dollar and euro is about 20 per cent and, as a rule of thumb, a 10 per cent rise in the trade-weighted dollar and euro takes about 0.5-0.6 per cent off inflation and real GDP growth over 18 months. So even if the renminbi is devalued by 10 per cent, the effect would be to cut US and European inflation and growth by only 10 or 20 basis points over a year, other things being equal. The same is true of the fresh fall in commodity prices. Yes, further weakness in commodities also weakens the near-term inflation outlook. But such falls wash out of year-on-year inflation data over time as base effects roll forward. And they amount to a tax cut for G10 producers and consumers. So although the renewed fall in commodity prices is striking, and its near-term effects undoubtedly significant, how it can directly justify a fall in long-term yields and inflation forwards is difficult to see. Nonetheless, long-term bond yields and inflation forwards in the US and Europe have been falling quite dramatically. Since the end of June, 30-year US Treasury yields, which should reflect investors’ expectations for long-term inflation and economic growth, have fallen 50 basis points. And this in spite of the fact that two-year yields, which reflect expectations for the path of official interest rates, have barely changed. One possible explanation for the bond and inflation markets’ recent behaviour is that it is just a short-term “risk off” move, together with the correction in stock markets, in thin summer trading, with consensus trades (short bonds, short US against Europe, long inflation) suffering the most. But what if the explanation is that investors are growing more fearful that disinflation pressures are secular rather than cyclical, with the weakening in China’s currency just the latest in a series of unsettling factors? There have been other signals that disinflationary forces are still with us. Pay growth in the US and UK, where rate rises are expected before anywhere else, remains sluggish in spite of falling unemployment. Core consumer price inflation (excluding energy and food) also remains below central banks’ policy targets, and is rising only slowly. The recent change in bond yields has been driven almost entirely by falling inflation expectations. Since the change in the Chinese currency regime, in both the US and the euro area the five-year forward inflation rate (favoured by central bankers as an indicator of medium-term inflation expectations) has given up more than half of the gains made since January. It is likely that during the coming months renewed fears of disinflation or deflation will increase rather than diminish. Weaker commodity prices and the renminbi devaluation mean surveys of inflation expectations are more likely to show a fall than rise in the near term; and the medium-term trajectory for inflation will be lower than previously thought. If so, we could well be in for a revival of the debate about whether central banks really do have the ability to overcome structural downward forces on prices, notably globalisation, technological change and demographics, to which we now add the after-effects of the global financial crisis. With the recent cyclical upswing, particularly the falls in US and UK unemployment, this debate has been in abeyance. The implicit assumption has been that the combination of zero interest rates, quantitative easing and economic recovery would bring about a revival in inflation. But this assumption is apparently now being questioned. If that is the case, any decision to raise official interest rates could soon start to seem like a policy mistake. For investors and for policymakers, worries about secular disinflation are proving difficult to slay. Amari, speaking at a seminar, said the consumer price index was not the only way to judge whether the economy was out of deflation. It was important for the economy to grow both in nominal and real terms and for the gross domestic product deflator to be positive, Amari said. Among the clearest casualties of China's devaluation is the Bank of Japan. The chances were never high that Governor Haruhiko Kuroda was going to be able to unwind his institution's aggressive monetary experiment anytime soon. But the odds are now lower than even skeptics would have previously believed. The real question, though, is what China's move means more broadly for Abenomics. A sharply devalued yen, after all, is the core of Prime Minister Shinzo Abe's gambit to end Japan's 25-year funk. Abenomics is said to have three parts, but monetary easing has really been the only one. Fiscal-expansion was neutered by last year's sales-tax hike, while structural reform has arrived only in a brief flurry, not the avalanche needed to enliven aging Japan and get companies to raise wages. 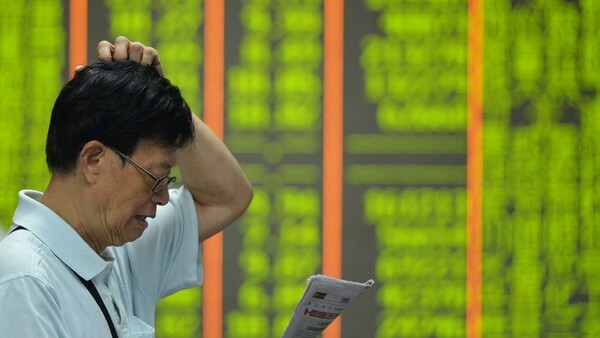 China's devaluation tosses two immediate problems Japan's way. The first is reduced exports. As Beijing guides its currency even lower, as surely it will, the yen will rise on a trade-weighted basis. And Bloomberg's Japan economist Yuki Masujima points out that trade with China now contributes 13 percent more to Japanese GDP than the U.S., traditionally Tokyo's main customer. "Given China's rise to prominence, the yen-yuan exchange rate now has far greater influence on Japan than the yen-dollar rate," Masujima says. The other problem is psychological. Japanese households have long lamented their rising reliance on China, a developing nation run by a government they widely view as hostile. But the BOJ was glad to evoke China's 7 percent growth -- and the millions of Chinese tourists filling shopping malls across the Japanese archipelago -- to convince Japanese consumers and executives that their own economy was in good shape. Now, the perception of China as a growth engine is fizzling, exacerbating the exchange-rate effect. "To the extent that the depreciation reflects weakness in China, then that weakness -- rather than the depreciation per se -- is a problem for Japan," says Richard Katz, who publishes the New York-based Oriental Economist Report. It's also a problem for Abe, whose approval ratings are now in the low 30s thanks to his unpopular efforts to "reinterpret" the pacifist constitution to deploy troops overseas. The prospect that Abe will enrage Japan's neighbors by watering down past World War II apologies at ceremonies this weekend marking the 70th anniversary of the end of the war is further damping support at home. The worsening economy, which voters hoped Abe would have sorted out by now, doesn't help. Inflation-adjusted wages dropped 2.9 percent in June, a sign Monday's second-quarter gross domestic product report for the may be truly ugly. It's an open question whether such an unpopular leader can push painful, but necessary, structural changes through parliament. "Already," Katz says, "Abe has backpedaled on many issues to avoid further drops." After 961 days, all Abenomics has really achieved is a sharply weaker yen, modest steps to tighten corporate governance and marketing slogans asking companies to hire more women. There could be a silver lining here: China's move may catalyze Abe to act. By undercutting Japan's devaluation, China might increase Abe's urgency to boost competiveness, innovation and wages. Already, Abe's surrogates are setting the stage for more BOJ easing. One top advisor, Koichi Hamada, told Bloomberg News that "the magnitude of China’s shock is much larger than that from Greece." China's devaluation, he added, "can be offset" by fresh BOJ action. But Abe would be wise to react with far more than just another yen devaluation. If Japan offers a cautionary tale, it's that weaker currency alone isn't the answer. If Abe had used the yen's 35 percent plunge since late 2012 to good effect -- passing big reforms on labor flexibility, import tariffs, tax policy, supporting startups, reducing red tape -- Japan might not be facing the prospect of another recession. Unless the prime minister changes course, Abenomics will be remembered as a policy that primarily benefited stock-trading hedge funds, not average households. Yesterday, in a rare press briefing, China's central bank downplayed fears of huge moves that destabilize markets. Yet as growth sputters, Beijing will weaken the yuan as much as it can get away with geopolitically. Depending on how Tokyo reacts, this could be the moment Abenomics gains traction or becomes a $4.6 trillion casualty of China's ascendancy. It remains to be seen whether Abenomics becomes a "$4.6 trillion casualty of China's ascendancy." One thing is for sure, we can't discount more yuan weakness placing pressure on Japanese authorities to weaken the yen further. And if these two countries start a full-blown currency war, it can get very ugly, very quickly. But China and Japan have to be very careful here. Why? Because the last thing they want is to export deflation across the world, especially in America. If that happens, the Fed's deflation problem will become its nightmare and that of central bankers across the world. Then it will really be game over for decades, not years. Speaking of the Fed, I disagree with Fed Vice Chairman Stanley Fischer, inflation isn't rebounding anytime soon and the Fed would be making a monumental mistake if it hikes rates in September thinking so. I think Minneapolis President Narayana Kocherlakota, who recently talked about the challenges of zero-bound rates and tail risks to the U.S. economy, is absolutely right and so is the bond king, who has warned the Fed not to move on rates this year. The problem with Stanley Fisher and many smart economists is they're still fighting the inflation boogeyman of the 1970s warning that "inflation is a lagging indicator." That may have been true in the past when we actually had inflation but in a deflationary environment, inflation is a leading not lagging indicator. This is why I am convinced that monetary authorities around the world are better off erring on the side of inflation now more than ever. They don't have much of choice. The deflationary structural headwinds that Alan Greenspan and Paul Singer ignore will swamp everything else. If central banks don't increase global inflation expectations, they're cooked and they know it. But money printing, zero rates and quantitative easing alone won't create sustained inflation. In fact, all this does is exacerbate rising inequality which is deflationary. In order to see a sustained increase in inflation expectations, policymakers in the developed world (especially in the eurozone) need to tackle their debt crises through growth initiatives. They need to create high-paying jobs with good benefits and tackle the global pension crisis in order to stimulate aggregate demand. They also need to increase immigration to deal with an aging population but first and foremost, they need to create jobs and spur growth so these immigrants can earn a decent living. At the very least, the U.S. and other developed nations need to give citizenship to smart students from across the world who can fill high value added jobs (what good is a Harvard or other Ivy League graduate if he or she leaves to go back to their country?). As far as markets are concerned, this constant tension between inflation and deflation is creating a lot of nervous Nellies. At this writing on Tuesday morning, a sick market is set to be tested further. Those who are betting big on a global recovery are anxiously waiting for some good news on global growth. 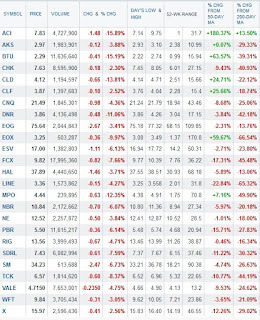 It could come soon but I remain very cautious on energy (XLE), oil services (OIH) and metal and mining shares (XME). We witnessed violent countertrend rallies toward the end of last week and even saw a spike in oil prices which carried into Monday but all these countertrend rallies were primarily fueled by short covering and some panic buying. 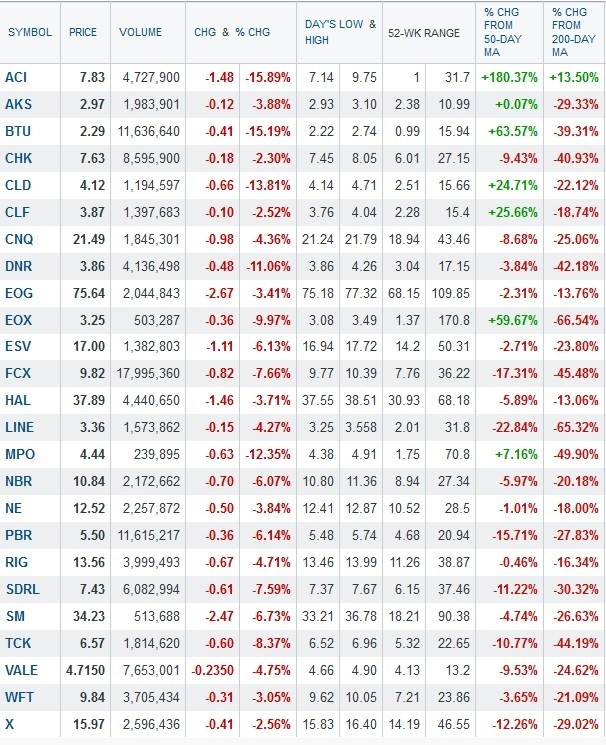 You'll notice the ones that got hit the most on Tuesday were the ones that really took off a lot recently like coal shares of Arch Coal (ACI) and Peabody (BTU) as well as small cap oil and gas exploration stocks like Midstates Petroleum Company (MPO) and Emerald Oil (EOX). And even the great Carl Icahn can't stop the downtrend in shares of Freeport-McMoRan (FCX). Of course, I warned you not to blindly follow Icahn, Soros or any other guru! Welcome to my world where I'm constantly looking at stocks across many sectors and trying to tie it all to the big, BIG picture. And despite my fears of global deflation and the flash crash of 2015, I still think now is the time to load up on biotech and hold on for the ride of your life! Below, CNBC's Rick Santelli reports the August read for ISM, falling to the lowest level since May of 2013. And as the markets dip lower Tuesday morning after the open, Jurrien Timmer of Fidelity Investments, discusses the health of the U.S. economy. Listen carefully to his comments.